Extremely durable acrylic enamel paint matches current U.S. Army (ACU) and U.S.M.C. 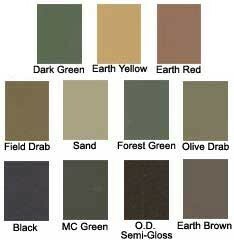 (MARPAT) color standards for digital camouflage patterns. Applications: metal, wood, plastic, fabric, vehicle restoration, weapons, and hunting and camping equipment.